These engines were Installed new -- not rebuilt. The seller of this boat is in fact a Mercruiser dealer. The generator is a Kohler in a sound enclosure. Viking quality makes this an outstanding cruising / fishing machine. Solid fiberglass hull with cored hull sides built to withstand the rough stuff. Truly among the best—if not the best—small flybridge cruisers ever produced, the Viking 35 Convertible was the gold standard by which other boats in her class were compared. The head is a Vacuflush with a new San X overboard treatment system. Has never been put into service. Waterline Boats / Boatshed does did not independently verify capacities and measures, which are reported from seller-provided information and/or literature. Starting at the interior bow is the V-berth cabin with access to the anchor locker. New mattresses, cabinet storage with small hanging locker. A hatch above and portlights in the sides provide ventilation and light. Moving aft to starboard is the head with sink, counter and mirror cabinet, and a glass door to the shower enclosure. Aft to port is the U-shaped galley with Norcold refrigerator with freezer. Fore and aft counter with a double stainless steel sink and a microwave on a shelf above. There are nice teak woodwork appointments and more than adequate storage above and below the counters including drawers and cupboard shelves. Aft and up two steps is the spacious main saloon and lower helm station. There is a couch and two matching occasional chairs. They have new cushions and the teak frames have been re-finished. There is a movable teak dropleaf dining table. Across the aft end of the saloon is a full floor-to-ceiling glass bulkhead with sliding glass entry door to the cockpit. There is a full enclosure over the cockpit and two new fishing chairs. Up the ladder to the flybridge there is a forward facing bench in front of the helm. The upper helm-flybridge has a full cover overhead. The cabin heat 120 electric and there is a Crusair reverse-cycle heat/air unit. There is an anchor launcher mounted on the stem head. Length of chain and rode are unknown. Stainless steel safety bow pulpit extends far aft along the side decks. Teak grab rails on flybridge sides. Custom stainless steel radar arch and full enclosure for the cockpit with a Bimini for the flybridge. This Viking 35 is being sold by only its second owner. Over the past ten years it has undergone a complete restoration and has been kept in indoor storage. The hull and deck have been polished. All wood trim and interior woodwork has been professionally re-finished. Custom stainless steel radar arch has been added as well as complete enclosure for the cockpit and a cover for the flybridge. New carpets and upholstery -- some still in plastic. Hew head system that has not been used. Most importantly is that the boat was repowered with new Mercruiser engines, transmissions and shafts which have only 20 hours. And a new Kohler genset too! In many ways this boat is better than new in respect to appearance, equipment and structure. The electric heat system has not been tested and that the remote start for the generator is not working at this time. 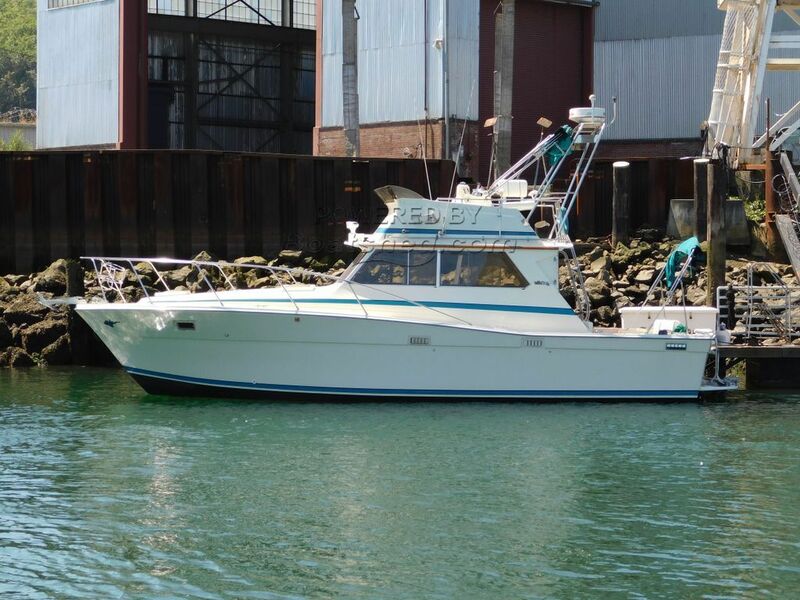 This Viking 35 Sportfish Flybridge has been personally photographed and viewed by David Carleson of Boatshed Seattle. Click here for contact details.